Although this plant looks quite innocent and harmless with gorgeous red flowers and small, compact leaved rosettes, it ‘eats’ with great appetite little insects using unique, highly sophisticated and efficient traps. Together with the genera Genlisea and Utricularia, Pinguicula belongs to the Lentibulariaceae, commonly known as the Bladderwort family. All family members are carnivorous plants. Currently, 88 species of the genus Pinguicula are known, most of which are located in the northern hemisphere. As early as 1479 a plant with the Old High German name ‘Smalz chrawt’, equivalent to Butterwort the common name of Pinguicula was first described in a manuscript on medicinal plants from the German monk and natural scientist Vitus Auslasser. Less than a century later, the Swiss medical doctor and natural scientist Conrad Gessner found a little blue Alpine plant on the Swiss mountain peak Pilatus, which reminded him at a Sweet Violet. He named it Pinguicula and published the Genus for the first time in his ‘Horti Germaniae’. This generic name has been adopted by Carl von Linné and is still valid today. The name Pinguicula is derived from the Latin ‘pinguis’, which means ‘fat’ and and is a description of the greasy texture of the leaves (Barthlott et al.2008, Casper 1966). Natural habitat. Pinguicula species are located in the most diverse climates and distributed on almost every continent. Primarily, they grow on moist, nutrient-poor soils in acid to neutral soil. P. laueana is an endemic species of the evergreen mountain cloud forests of the Mexican mountain range ‘Sierra Mixe’. 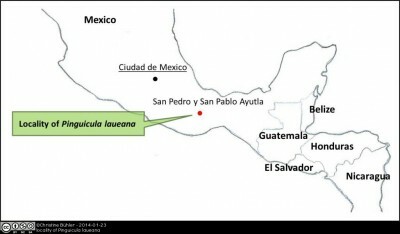 The area near the village of ‘San Pedro y San Pablo Ayutla’ is so far the only place this species have been found. 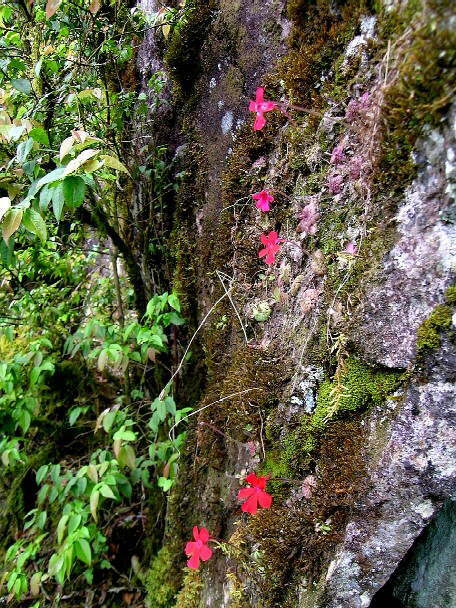 The tropical climate with plenty of rainfall and a generally high humidity suits the growth of P. laueana on vertical moss-covered limestone cliffs over 2000m.ü.M., along with other Pinguicula species, orchids and bromeliads (Gluch 2014). This location on the steep rocks with little soil and nutrients and dryer winter months show how impressive these survivalist plants are. In recent years, this species has already proven successful and effective in cultivation and is very popular among carnivorous plant lovers, especially because of their exceptional flower colour (Carow 2009). Carnivorous behaviour. The leaves are specially adapted due to their physiological determination as insect catcher and devourer. However, why have some plants even made the evolutionarily effort to develop into carnivorous brutes, against the natural concept of the food chain? Normally, plants are eaten by herbivores and herbivores subsequently by carnivores. Carnivorous plants are survivalist in nature. There are plants which have developed strategies in the course of evolution to procure missing nutrients in very harsh, adverse environmental conditions such as nutrient-poor, temporarily waterlogged or rocky soils. By attracting and catching their prey, they can digest the entrapped animal tissue using enzymes and utilize them as live essential nutrients (Honda 2013). The genus Pinguicula has appropriated a unique and sophisticated strategy, which is one of the most efficient traps (Legendre 2000). It forms a so-called adhesive or sticky flypaper trap from which they can capture gnats and midges. Whether the slight mushroom scent emanating from the compact rosette of leaves or the shiny surface of the leaves is the reason for the attraction, is not yet known (Honda 2013). The surface of the leaves is covered with numerous small short-stalked glands producing secretions mucilaginous as transparent tiny droplets on the tip of each stalk. After an insect lands on the leaf, their limbs entangle in the glue-like fluid and they cannot escape anymore. Digestive enzymes are secreted immediately. Often a leaf movement is observed in Pinguicula. The leaf edges curl inwards slightly and cover the insect to promote more effective absorption. The active movement is relatively slow, taking between few hours and a few days (Legendre 2000). Surprisingly, Pinguicula can also use other food sources with great efficiency. Several laboratory studies have shown that feeding with pollen has strongly promoted better growth with faster and greater flowering (Harder and Ziemlin 1969). According to Legendre (2000), the perennial Pinguicula laueana is a species of the tropical climate forming a ‘tropical heterophyllous growth type’, which means that they produce two different leaf rosette types. During the humid summer months, larger leaves are formed, and in the drier winter months small, tightly packed leaves and a bud-like structure develop. The winter rosette tolerates desiccation and moreover, less glandular secretions are present on the surface of the winter leaves, so less prey are caught (Barthlott 2008). The summer and winter leaves look confusingly similar to those of P. moranensis, however, with the help of the flower, noting the colour and the shape, they can be clearly distinguished (Gluch 2014). Flower and pollination. 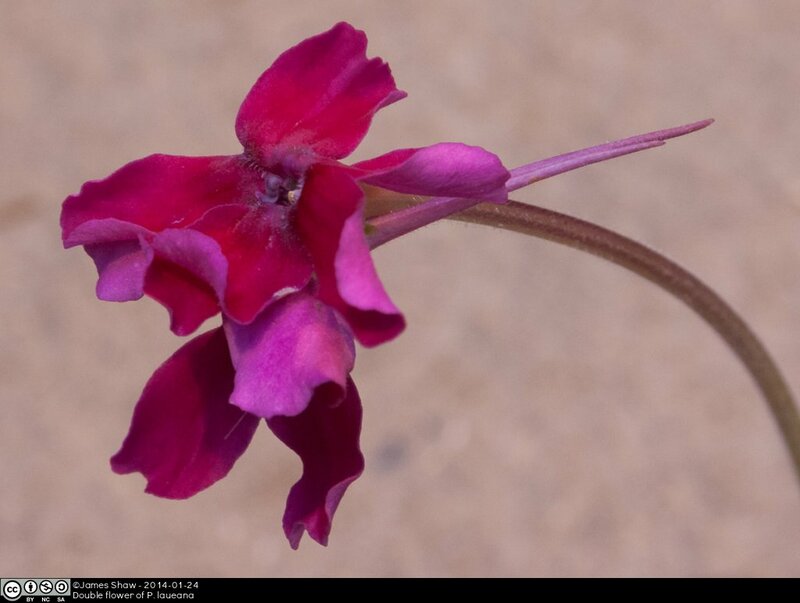 To date Pinguicula laueana is the only species known to have bright scarlet-red flowers. The zygomorphic, unique and stunning flower is made up of five partially fused petals, two in an upper lip and three in a lower lip. They flourish in their natural habitat from April to August, however, they can even bloom in cultivation during the winter. The peduncle and the flowers are provided with dense glandular hairs. An unusually long nectar containing spur, formed by the abaxial petal, which can be up to twice as long as the flower itself, gives the this carnivores plant an elegant look (Speta and Fuchs 1989). Based on the flower structure, mainly because of the elongated spur, it is believed that the plant is pollinated by insects with long proboscis. Schnell (2002) confirms the pollination by insects and assume that it is pollinated by small bees. However, pollination involves clearly some risks for the insects and leads inevitably to the pollinator – prey dilemma: Devour or rather copulate? Several approaches seem plausible: Different classes of insects for pollination and diet or a separation in time of flower production and catching prey. What strategy Pinguicula applies and which insect is involved or whether self-pollination takes place, is still the subject of investigations. A small selection of Mexican Pinguicula are grown in our Tropical glasshouse. This entry was posted in Carnivorous Plants, Learning and Teaching, Low Nutrient Environments, Mexico, Neotropics, People, Species, Students and tagged carnivorous plant, Mexican Butterwort, Pinguicula, Pinguicula laueana, Pinguicula sect. Orcheosanthus, scarlet-red flower. Bookmark the permalink. We can – and should – love this plant for promoting the extinction of mosquitoes. And yes, Pinguicula should become a permanent member of the United Nations.